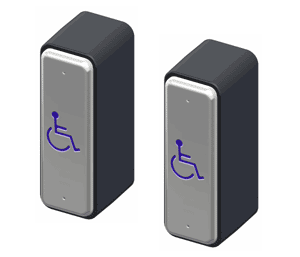 The ADA-EZ is a wire free handicap commercial door opener allowing for easy access into your facility by people with disabilities. 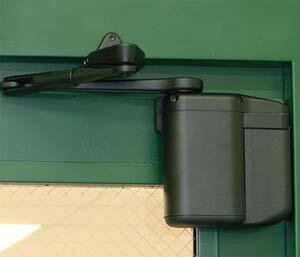 The ADAEZ door opener is a heavy duty, low energy door opener intended for commercial use. It uses a Regenerative Drive System* which charges a battery pack, eliminating the need for electrical power under certain conditions*. (The kit also comes with a plug-in transformer for continuous power.) The battery acts as a built-in power supply during a power outage. 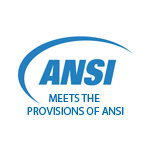 The unit is small in size but is very robust and is simple to install and use. 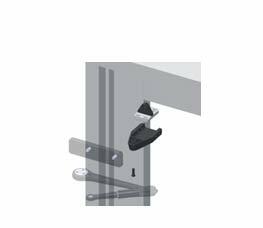 ADA EZ has been designed for doors up to 48” in width and 250lbs in weight. 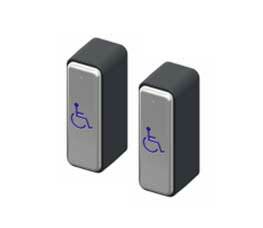 Included are two jamb style wireless push buttons with transmitters, plug-in hard wire option, push or pull mounting hardware and an aluminum dress cover making the ADA EZ door operator a complete ADA door opening solution. Larger activation switches are available. *The regenerative drive system produces a small trickle charge which charges the battery every time the door is opened manually. In order for the system to remain fully charged indefinitely without using the included power supply, the door must be opened manually approximately 80 times in order to offset 20 automatic uses and keep the charge at 100 percent. A fully charged battery has approximately 2000 cycles even if the door is never opened manually so there is no daily limit for the number of openings. So if your door is activated with the wireless buttons more than 20 times per day and you have less than 80 manual openings, the ADAEZ will continue to open the door but the battery will eventually need to be recharged. 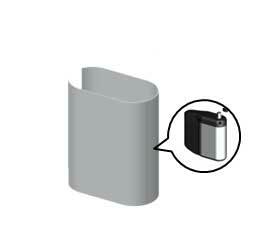 The battery on a full charge will operate the door approximately 2000 cycles before needing to be charged. 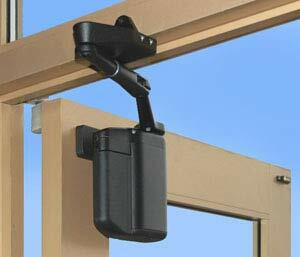 ADAEZ Pro non-handed operator with mounting hardware, black cover. Two narrow style wireless stainless steel push buttons. Square buttons are available. 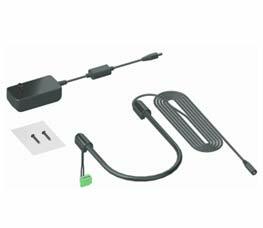 Plug-in power supply includes 24V transformer, 50 feet of low voltage wire. 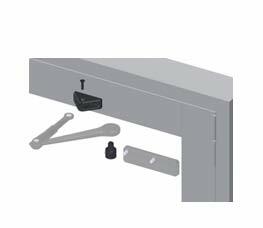 Non-Handed Pull side of the door mounting hardware. 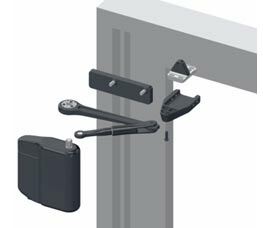 Non-Handed Push side of the door mounting hardware. Powder coated aluminum dress cover. Call 1-877-258-7423 if you have questions.